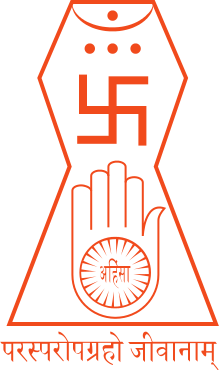 In Jainism, a tirthankara (Sanskrit tīrthaṅkara) is an omniscient Teaching God who preaches the dharma (righteous path). The word tirthankara signifies the founder of a tirtha, which is a fordable passage across the sea of interminable births and deaths, the saṃsāra. According to Jains, over time, Jain teachings are gradually forgotten. Then, a rare individual is born who at some point in his life renounces the world to conquer the saṃsāra, the cycle of death and rebirth, on his own. After understanding the true nature of the Self or soul, the Tīrthaṅkara attains Kevala Jnana (omniscience) and refounds Jainism. Tirthankara provides a bridge for others to follow the new teacher from saṃsāra to moksha (liberation). 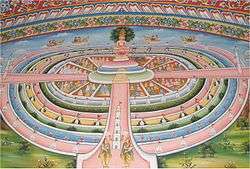 According to Jain cosmology, in each half of the cosmic time cycle, exactly twenty-four tirthankaras grace this part of the universe. The first tirthankara was Rishabhanatha, who is credited for formulating and organising humans to live in a society harmoniously. The 24th and last tirthankara of present half-cycle was Mahavira (599-527 BC). History records the existence of Mahavira and his predecessor, Parshvanatha, the twenty-third tirthankara. A tirthankara organises the sangha, a fourfold order of male and female monastics, srāvakas (male followers) and śrāvikās (female followers). The tirthankara's teachings form the basis for the Jain canons. The inner knowledge of tirthankara is believed to be perfect and identical in every respect and their teachings do not contradict one another. However, the degree of elaboration varies according to the spiritual advancement and purity of the society during their period of leadership. The higher the spiritual advancement and purity of mind of the society, the lower the elaboration required. While tirthankaras are documented and revered by Jains, their grace is said to be available to all living beings, regardless of religious orientation. Tīrthaṅkaras are arihants who after attaining kevalajñāna (pure infinite knowledge) preach the true dharma. An Arihant is also called Jina (victor), that is one who has conquered inner enemies such as anger, attachment, pride and greed. They dwell exclusively within the realm of their Soul, and are entirely free of kashayas, inner passions, and personal desires. As a result of this, unlimited siddhis, or spiritual powers, are readily available to them – which they use exclusively for the spiritual elevation of living beings. Through darśana, divine vision, and deshna, divine speech, they help others in attaining kevalajñana, and moksha (final liberation) to anyone seeking it sincerely. The word tirthankara signifies the founder of a tirtha which means a fordable passage across the sea of interminable births and deaths (called saṃsāra). Tirthankaras are variously called "Teaching Gods", "Ford-Makers", "Crossing Makers" and "Makers of the River-Crossing. Fervent affection for one’s brethren following the same path. Gārbha kalyāṇaka (conception): When ātman (soul) of a tirthankara comes into his mother's womb. Janma kalyāṇaka (birth): Birth of a tirthankara. Indra performs a ceremonial bath on tirthankara on Mount Meru. Jñāna kalyāṇaka: The event when a tirthankara attains kevalajñāna (infinite knowledge). A samavasarana (divine preaching hall) is erected from where he delivers sermons and restores sangha after that. Nirvāṇa kalyāṇaka (liberation): When a tirthankara leaves his mortal body, it is known as nirvana. It is followed by the final liberation, moksha. Their souls dwells in Siddhashila after that. After attaining kevalajñāna, a tirthankara preaches the path to liberation in the samavasarana. 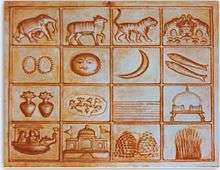 According to Jain texts, the heavenly pavilion is erected by devas (heavenly beings) where devas, humans and animals assemble to hear the tirthankara. A tirthankara's speech is intercepted by all humans and animals in their own language. It is believed that during this speech, there is no unhappiness for miles around the site. Jainism postulates that time has no beginning or end. It moves like the wheel of a cart. In Jain tradition the tirthankaras were royal in their final lives, and Jain texts record details of their previous lives. Their clan and families are also among those recorded in very early, or legendary, Hindu history. Jain canons state that Rishabhanatha, the first tirthankara, founded the Ikshvaku dynasty, from which 21 other tirthankaras also rose over time. Two tirthankaras - Munisuvrata, the 20th, and Neminatha, the 22nd - belonged to the Harivamsa dynasty. 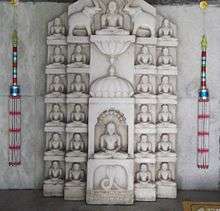 In Jain tradition, the 20 tirthankaras attained moksha on mount Shikharji, in the present Indian state of Jharkhand. Rishabhanatha attained nirvana on Mount Kailash, presently located in Tibet, close to Indian border, Vasupujya at Champapuri in North Bengal, Neminatha on mount Girnar, Gujarat, and Mahavira, the last tirthankara, at Pawapuri, near modern Patna. Twenty-one of the tirthankaras are said to have attained moksha in the kayotsarga (standing meditation posture), while Rishabhanatha, Neminatha and Mahavira are said to have attained moksha in the Padmasana (lotus position). In chronological order, the names, emblems and colours of the 24 tirthankaras of this age are mentioned below: Dhanuṣa means "bow" and hatha means "hands". A tīrthaṅkara is represented either seated in yoga posture or standing in the Kayotsarga posture. Usually they are depicted seated with their legs crossed in front, the toes of one foot resting close upon the knee of the other, and the right hand lying over the left in the lap. The first Tirthankara, Rishabhanatha is mentioned in Hindu texts like Rigveda, Vishnupurana and Bhagwata Purana. The Yajurveda mentions the name of three Tīrthaṅkaras - Ṛiṣhabha, Ajitnātha and Ariṣṭanemi. The Bhāgavata Purāṇa endorses the view that Ṛiṣhabha was the founder of Jainism. Champat Rai Jain, a 20th-century Jain writer claimed that the "Four and Twenty Elders" mentioned in the Christian Bible are "Twenty-four Tirthankaras". Wikimedia Commons has media related to Tirthankara. 1 2 Sangave 2006, p. 16. 1 2 Taliaferro & Marty 2010, p. 286. ↑ Sangave 2006, p. 164. 1 2 Champat Rai Jain 1930, p. 3. ↑ Natubhai Shah 2004, p. 15. ↑ Dundas 2002, p. 276. ↑ Zimmer 1953, p. 209-210. ↑ Rao 2007, p. 13. ↑ Champat Rai Jain 1930, p. 78.